BOC introduces the new BOC Chinese Cultural Debit Card which is also a Platinum MasterCard. This new Debit Card allows you to enjoy more convenience and enjoy exclusive privileges at China Cultural Centre, bringing you closer to Chinese arts and culture. Enjoy free access to over 17,000 arts and cultural books in the library of China Cultural Centre using the new BOC Chinese Cultural Debit Card. At the back of the card, you will find barcode which allows you to have free access to the library services. For the first visit, you are required to bring along your BOC Chinese Cultural Debit Card with your NRIC/Passport to the library in China Cultural Centre for activation. Use your BOC Chinese Cultural Debit Card to purchase performance tickets organised by China Cultural Centre and enjoy discount of up to 10%. BOC Chinese Cultural cardholders will have a chance to receive free tickets to activities that BOC has prepared specially for you. Sign up for the workshops1 organised by China Cultural Centre using BOC Chinese Cultural Debit Card and enjoy discount of up to 10%. 1 To find out more about the workshops organised by China Cultural Centre, please visit www.cccsingapore.org. Through MasterCard’s global network, you can use your BOC Chinese Cultural Debit Card at MasterCard merchants located worldwide and withdraw cash at overseas ATMs bearing “MasterCard” logo at any time of the day. With MasterCard PayPass, you can tap your BOC Chinese Cultural Debit Card for quick and fuss-free payment for your transactions at merchants accepting contactless-enabled cards. Be one of the first to tap your BOC MasterCard “contactless” card to pay for your bus and train rides in the Account-Based Ticketing (ABT)2 pilot with Land Transport Authority (LTA) and TransitLink now! 2 For full list of FAQ and Terms and Conditions on the Account-Based Ticketing (ABT) Pilot, please visit TransitLink ABT Portal at https://abt.transitlink.com.sg. Please contact TransitLink Hotline at 1800 2255 663 for further ABT pilot enquiries. 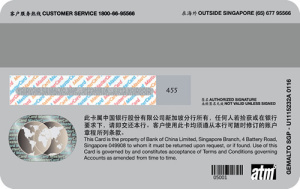 You can use your BOC Chinese Cultural Debit Card at over 200 ATMs bearing atm5 logo in Singapore to check your account balance and perform cash withdrawals without any transaction fees. 4. Easy access to global withdrawals and transactions. No transaction fee for withdrawal via more than 24,000 BOC ATMs in China's Mainland. Plus enjoy exclusive offers from BOC’s merchants located around the world. Enjoy 0.1% cash rebate3 with a minimum spend of S$100 per month when you make your purchase using BOC Chinese Cultural Debit Card in Singapore and overseas. 3 Cash rebate is capped at a maximum of S$10 per calendar month. You can apply our BOC Chinese Cultural Debit Card at any BOC branch. At the back of this Debit Card, there is an inactivated barcode which can function as a library card in China Cultural Centre. You will need to visit the China Cultural Centre personally with your NRIC, Passport or long-term visit pass in order to activate the barcode to enjoy the borrowing privilege in the library. You are required to pay a deposit under the centre’s policy. Step 3: You can now use your BOC Chinese Cultural Card to borrow books from the library in the China Cultural Centre. Note: If you wish to deactivate the barcode, please visit China Cultural Centre personally with your NRIC or Passport and receipt of the deposit to process your request. The remaining deposit will be refunded once the deactivation has been completed. Disclaimer: Bank of China may vary or discontinue any debit card promotion/privilege at any time without any notice or liability to any party. Bank of China assumes no responsibility or liability for the acts or defaults of China Cultural Centre. Any complaint or dispute about any function or service provided by China Cultural Centre must be made or resolved directly with China Cultural Centre. BOC Chinese Cultural Debit Card is subject to Terms and Conditions governing Accounts.